The requirements were not that complex and so I thought of developing my own component. The process started with identifying the right approach for developing this component. If you are already familiar with Angular, most of the things written above must be known to you. @Input defines values that you can pass to the component and @Output is used to provide meaningful information to calling routine. The interesting part is @Component, which uses ChangeDetectionStrategy. 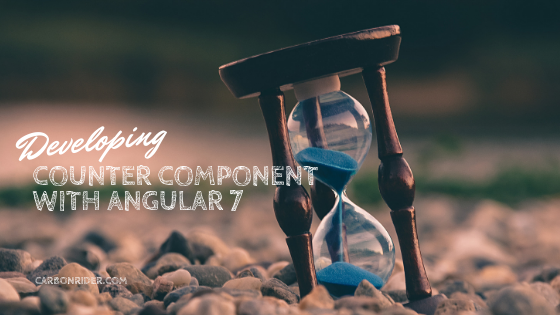 Instead of relying on default implementation, we know that the component should be updated at regular intervals rather than leaving it at the mercy of Angular’s default change detection strategy. This is also a recommended practice to improve performance and reliability of the component. As soon as the start method is called, we set the initial value of the counter to the startAt variable. This shows total time. map – Useful to transform value received from take. The value received from take is reduced from Total time. subscribe – Finally, we need the computed value to display in Counter. The subscribe method has 3 blocks. The first block gets called every time the value is computed by map. The second err block is called when there is an exception. The third block is called when the counter reaches to 0. The First block of subscribe constantly updates the value to be displayed in Counter. The value is passed to a formatter function and assigned to a variable. This variable is referenced in the component’s template and the change in value is informed using the ChangeDetector. Refer to following HTML code for Counter. The complete block of subscribe ensures the cleanup activities after the counter value is exhausted. The block also emits a state to indicate that the counter has reached to the zero. This is useful to perform any actions based on timed activities. We then invoke ChangeDetector again to refresh the Counter’s appearance. As stated, we also need a stop method to explicitly stop the Counter. This is useful in a scenario wherein a user is done with the time bound activity and wish to move to the next one before the time elapses. We are done with coding our counter component. The takeaway from this implementation is to develop a component which can emit a value and keep the application informed about it’s state. This reduces mingling of component APIs with each other and reuse them wherever required. Check this stackblitz link for complete source code and Demo.